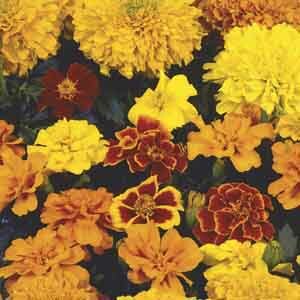 Marigolds bring a non-stop burst of sunny bright blooms to the garden all summer long. Their texture is the perfect compliment to broad leaf and trailing companion plants. Removing spent blooms will assure the most prolific flowering. The perfect choice for beds and borders. Superb for baskets, containers and window boxes. Wonderful for combination plantings. Cut flowers are long-lasting in fresh bouquets. A heat tolerant selection. Best in fertile, well-drained soil. Keep soil moist, watering freely in dry weather. Fertilize regularly. Remove faded flowers for best display.